The musing, memories and observations of our octogenarian seedman, David Tostevin. This then led on to us becoming involved with the production of several Mail Order Seed Catalogues for customers overseas. Our previous background had been in Mail Order and so we took on this new challenge with some relish, providing customers with seeds in Mail Order Packets for them to sell on to their customers. At that time it did not occur to us that we could do the same in the UK ourselves. In 1995 the penny finally dropped and we decided to enter the Mail Order world. We began very tentatively with a 20 page catalogue with only 30 images. Over the years as our customer base grew and our knowledge and methods improved we broadened the range of varieties we offered. It has always been our policy to offer something a little different not necessarily always rare but perhaps a different colour or something just a little out of the ordinary. Indeed you won’t find many people offering as wide a choice of flowers in single colours as us. Unlike the major Seed Houses we don't find ourselves restricted by the same overheads and so it does give us the chance to showcase varieties that others find difficult to stock due to price alone. We seem to have been able to overcome this problem and are able to offer the rare, the unusual and different seeds at fair and competitive prices. Until 2004 we had pretty well restricted our catalogue to flower seeds and plants but as so many customers kept asking for vegetables we rose to the challenge again and the Simply Vegetables Catalogue was born. Again we produced a small catalogue concentrating on Heirloom Tomatoes and Peppers. These were very well received but the cry was still for more traditional varieties and so we kept expanding the range until you see the current inventory today. Much like the Flower Catalogue we try to find something a little different and unusual but our main focus is to supply what we feel is the best within any species be it Brussel Sprouts, Broccoli or Peas. We can't possibly stock every variety available but we hope we have included what we consider to be the best for sowing at various times in the year. 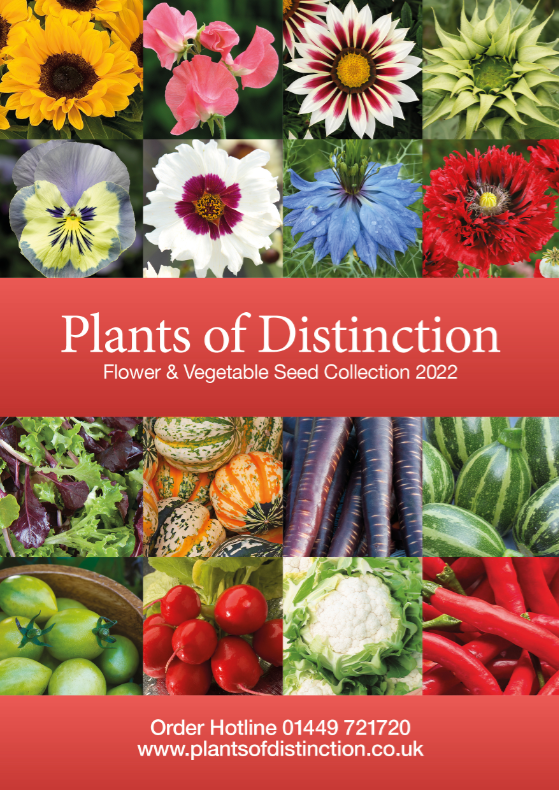 That really is a brief resume of how Plants of Distinction has evolved. There are big gaps in between as we are sure you can imagine but our aim has always been much the same. To bring to our customers what we consider to be the best, the different, the rare and in the case of vegetables, the tastiest of varieties. As to the staff, not a lot has changed over the years. We began with David Tostevin and Sarah Missing both with a history in the Mail Order Seed Business. David has a vast knowledge and experience of the Seed Trade and has spent many years travelling around the world looking for unusual and different varieties. He ventured into so many far flung countries during the 1970s and 1980s when Seedsmen just didn’t travel further than Europe and he has many stories of his various adventures during that time that we hope to share them with you over the months ahead. Sarah grew up in the Seed Industry joining David in 1981. Over the years she has been privileged to be part of that changing world. With the advent of better communications it has been so much easier to build relationships with foreign suppliers and customers and although never wishing to claim any great skill in this area she has gained much experience through the patience and kindness of her computer architect Jonathan who has guided her over the years particularly when taking our first steps into online ordering. There have been many late nights downloading, uploading and publishing our website over the years and so we are very excited and perhaps a little nervous (we have to admit) at launching the new improved site which we hope you will find much more informative and easy to use. Our thanks also goes to Donna who has helped oversee design and production of the new website and has brought everyone and everything together. Over time we introduced another generation of the Tostevin family to the business. Guy heads our production department and much of the filling and packaging of your orders is due to his hard work and dedication. We would be lost without him. In the background, but equally valued is David's wife Pam – she works along side Guy through the winter months picking and packing your orders. She has been an invaluable support over the years and is very experienced in not only harvesting seed, filling seed packets but she spends many hours addressing envelopes to all of you who request catalogues the old fashioned way via the telephone or by letter. On the Missing side of the family and our oldest employee is Harry – at 91 he still continues to support us as best he can. He loves his vegetable garden and is only too happy for us to hand over samples of new varieties he can grow for photographing and evaluation. He has spent many a day hand filling Pea and Bean packets and we hope he will continue to do so for many years to come. Much of the success of our catalogues and website are not just down to us but a team of people who have been so loyal over the years. To single out one person is difficult but not impossible. We wouldn't know where we would be without our designer Emma. She has worked with us for so many years that she almost knows what we want before we say anything! We owe a lot of credit to her and the rest of the team at Propeller Design for their input over the years. You couldn’t wish for a nicer bunch of people to work with. Last but not least, we have to say a big thank you to Rick, Sue and all the team at TFL who are our support network not only answering all your Hotline Calls but who also play a big part during the summer in the preparation for the forthcoming season. We hope this gives you a small insight into our world and the people who matter to us. As a small family run business our colleagues and customers are so important. We do our best to treat everyone as individuals not just customer reference numbers. We're not infallible and during the peak of the season there may be times we fall short but we are only on the end of a phone line or computer and we will do our best at all times to serve you well. Our very grateful thanks for your support and as we have said many times over the years – if you like what you see please tell your friends and family!